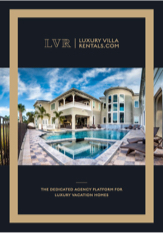 Please complete the online form to download the LuxuryVillaRentals.com brochure. Thank you for submitting the form. Use the download button below to start downloading the brochure. We have encountered an error. Please try again later! Contact us today if you have any questions or need assistance. A LuxuryVillaRentals.com representative will be happy to help. Just fill out the online form or contact us via telephone or email. to keep updated with the latest LuxuryVillaRentals.com news and special offers.